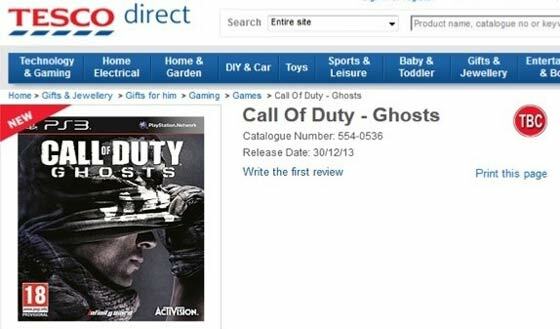 The next Call of Duty game will almost certainly be called ‘Call of Duty: Ghosts’. What looked like final product image shots, of the new and as yet unannounced title, appeared in a retail listing on Tesco Direct yesterday. The page has since been taken down but the canny guys at games industry news site MCVUK had already grabbed the pics. 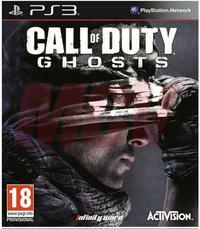 MCV noted that the box art names Infinity Ward as the developers of Call of Duty: Ghosts. Apparently it is Infinity Ward’s turn to make a Call of Duty title as Treyarch developed last year’s Black ops II. MCV also speculated that the ‘Modern Warfare’ strapline has been dropped due to a legal issue with former Infinity Ward bosses. While the Tesco leak had a placeholder date of 31st December 2013, which doesn’t tell us much, another source, Charlie Intel, indicates that the release date is 5th November 2013, at least in the USA. 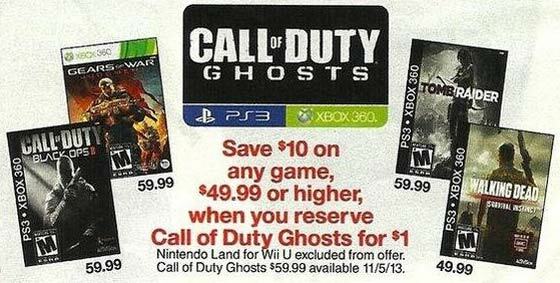 Charlie Intel, published a scan of a leaflet from big chain retailer Target in the US. The leaflet doesn’t feature any box art from ‘Call of Duty: Ghosts’ but it does show its logo and that it is incorporated in a special offer which will be run at the store, for Xbox 360 and PS3 owners. You can see the section of the leaflet displaying this offer below. 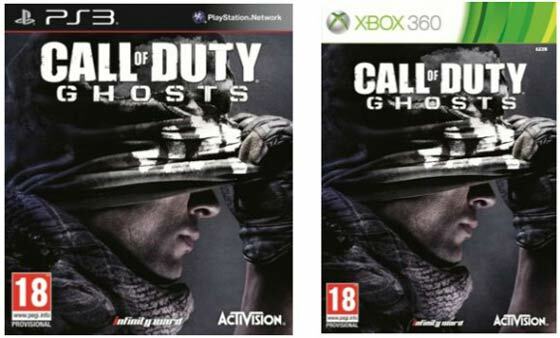 The picture on the box art appears to show a game character pulling on a mask, which may well be the same as the character called ‘Ghost’ in Modern Warfare 2. According to sources quoted by VideoGamer.com the game will be “branching out of the Modern Warfare series” and “moving into a different direction”. We will find out much more when the game is formally revealed, in the next week or so. I enjoyed COD1+UO, COD2, COD4MW, MW2, BO1. Although I reluctantly bought MW3 and BO2 they are both pretty poor. After 2 weeks of BO2 I'm already bored of it and am going back to BF3 with their latest DLC's which I've still not tried. gamestop was first, then game, then tesco. dam what is with people jumping on tescos back all the time. CoD4 was the best game in the series, it went downhill after that. WaW was okay but had issues and wasn't as fun. MW2 was fun with friends but just wasn't a good game from a competitive/balance standpoint. Every game after that just wasn't fun. CoD4 was the best game in the series, it went downhill after that. Totally agree - heck I still dig out CoD2 for a quick blast every so often. BO2 I think probably is a better game than the previous ones, but I enjoyed it a LOT less. Heck even MoH:WF was better. My question is - but how? The only thing I think they could conceivably do is to steal some ideas from other games e.g. the cover system from Gears; the squad mechanic from Ghost Recon (although BO2 has done that already to a limited extent); or the stealth features from Assassin's Creed (the good ones, not the latest US-based effort). Just as long as there's no zombies - can't stand games that add a “zombie” mode as a ‘incentive’. Back to the article, not sure that I'll bother with the latest CoD unless there's something new.